With aging, come new challenges due to reduced energy needs, possibly impaired nutrient absorption, increase in requiring assistance with shopping or meal preparation, and increase in possible depression or other health issues that may interfere with food preparation and enjoyment. The process of ageing also affects other nutrient needs. For example, while requirements for some nutrients may be reduced, some data suggest that requirements for other essential nutrients may in fact rise in later life. There is thus an urgent need to review current recommended daily nutrient allowances for this group. 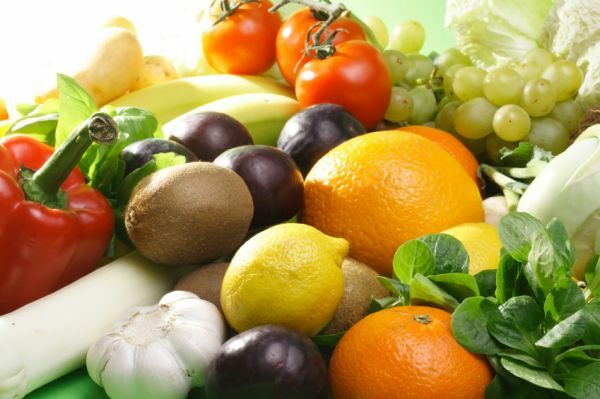 Generally, doctors will recommend a well-balanced diet for older adults, meaning that they should eat a variety of fruits, vegetables, proteins and whole grains to maintain and improve overall health. How are the elderly persons different? Ageing affects almost all the systems of the body, and is associated with several physiological, metabolic and psychological changes. The changes include decline in physical activity, digestion, metabolism, bone mass and muscle mass. Failing eye-sight and impaired hearing may also occur. Low appetite as a result of loss of taste and smell perception, dental problems, atrophic changes in GIT, constipation and decreased physical activity could lead to overall decrease of food intake and poor absorption of nutrients. Inability to prepare food, economic dependency and other psycho-social problems adversely affects the health and nutritional status of the elderly. There is a decline in immune function with advancing age, which leads to decreased resistance to infectious diseases. The increased parathyroid hormone (PTH) secretion in the elderly leads to increased bone turn over i.e. osteoporosis. Similarly, elderly individuals are at increased risk of osteomalacia i.e. defective bone mineralization due to lack of exposure to sunlight and poor diet. The need for calcium increases as people age. This is primarily to preserve bone health. One added benefit of calcium is that it helps to lower blood pressure.The World Health Organization (WHO) recommends that adults over the age of 50 get at least 1200 milligrams per day of calcium – equal to about four cups of fortified orange juice, dairy milk, or fortified non-dairy milks such as almond or soy. Leafy greens like kale and turnip greens are also great sources of absorbable calcium. Many people find it challenging to consume this much calcium per day by eating and drinking, so check with your loved one's doctor to see if he or she should take a calcium supplement. The acids have been proven to reduce inflammation, which can cause heart disease, cancer and arthritis. They can be found in flaxseeds and flaxseed oil, walnuts, canola oil, and different types of fish. Your older relative should have foods rich in this nutrient twice per week. If this is impossible, check with their doctor to see if an Omega 3 supplement would be beneficial. Protein needs will stay about the same as younger adults or may decrease. Kidney function is decreased in the elderly, so it's important to consult with a doctor or a dietitian for more specific protein needs. Good fats, such as fish, olive oil, canola oil and low-fat dairy products, should be eaten more than fast foods and whole milk. For those with hypertension (high blood pressure) one of the most important things caregivers can do to help reduce a loved one's hypertension is to prepare foods that are low in sodium. Most people are surprised to find out that added table salt accounts for only a small percent of sodium content in food. Frozen, processed and restaurant foods are typically extremely high in sodium, and should be avoided or only be a very small part of the diet. Fresh and frozen fruits and vegetables, dry beans, unsalted nuts and nut butters, and grains like brown rice and oats are all foods that are naturally low in sodium, so try and incorporate them as much as possible in their diet. As people age, they do not get thirsty very often, even though their bodies still need the same amount of liquids. If you notice that your loved one is not drinking liquids very often, make sure that you provide them with it. If they do not feel thirsty, chances are they may not think about drinking a glass of water. If you are concerned that your loved one may not be properly hydrated, check his or her urine. Urine is the surest sign of hydration or lack of it. If their urine is clear and light, then they are most likely properly hydrated. If, however, their urine is dark and/or cloudy, they will need to start drinking more liquids. Making dietary changes can be difficult for anybody. It can be especially difficult for older adults, though, because people get stuck in habits. 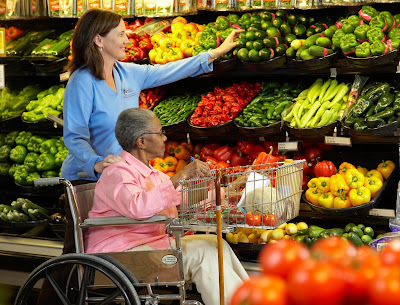 If your loved one needs to make dietary changes to increase their health and well-being, there are specific things that you, the caregiver, can do to help with the change. Adequate calcium and vitamin D is optimal for bone health. Adults over 75 should consume 20 micrograms of vitamin D and 1,200 milligrams of calcium per day. Increase calcium and vitamin D by eating green leafy vegetables, milk fortified with vitamin D, yogurt and fruit juice. 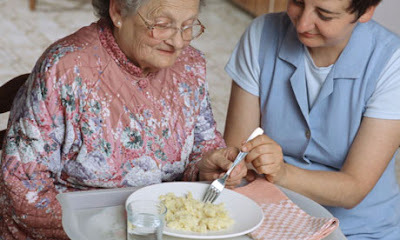 The Academy of Nutrition and Dietetics reports that the elderly don’t consume enough vitamin B12 in their diets. Adults 75 and over should get 2.4 micrograms of vitamin B12 each day through fortified cereals or supplements. Water makes up about half of your total body weight and you need to drink about 2 litres of fluid a day for good health. Drinking plenty of fluid will help to ease the burden on your kidneys and keeps your bowels regular. People also feel less thirsty as they age so you should try and keep track of your daily fluid intake. Don’t wait until you are thirsty before your drink - you may already dehydrated. Many older people do not have their own teeth – 59% aged 65 to 74 use dentures according to one survey. Poor dentition and ill-fitting dentures may limit the type and quantity of food they eat. Chewing problems are associated with a greater likelihood of poor health and decreased quality of life. Depression is common in older people and can present in 2% to 10% of the community. One of the most common presentations is loss of appetite and weight loss. It has been documented that 30% to 36% of weight loss seen in outpatients and the nursing home is due to depression. An inverse relationship between energy intake and cognition has been shown in hospital patients with dementia. Weight loss and changed behavior are associated with late stage disease. Fifty percent of patients with Alzheimer’s cannot feed themselves 8 years after their diagnosis. Also olfactory changes occur in Alzheimer’s which may affect food intake. Older people living on their own and socially isolated tend to eat less. These same people eat up to 50% more with company.